Why Are There Water Stains on my Bathroom Tub and Tiles? Water stains on the tiles and tub of the bathroom can be unsightly and very difficult to remove if left untreated. While there are some things that you can do to help the problem, it is best to be informed to what the underlying cause is so that you can attack the problem more easily. This information provided will give you all the tips and tricks needed to fight those stubborn stains from appearing in the first place. What Caused the Staining on my Tub and Tiles? Even though the local water treatment facility is hard at work trying to provide the cleanest possible water for local residents, microscopic mineral deposits are hard at work making it a challenge for you to keep your hope spotless. Those minerals become trapped in the hot water heater, where they come in contact with dozens of gallons of water waiting to be used in your shower or bathtub. 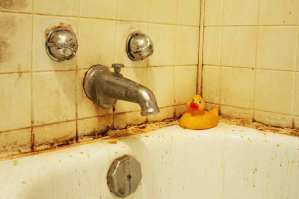 The deposits cause the water to discolor, ending up on your tiles and tub. Is There a Way to Prevent the Stains from Reappearing? The best way to prevent the stains from appearing is to simply stop them from entering the house in the first place. The way that you do that is by calling your local plumbing repair company and first have them flush the hot water heater, then secondly install a new water treatment system. These water systems range from small under the sink varieties to whole-home systems that improve all the water quality in the home. Each time you run a shower, bath, or turn on a faucet, you will be provided the cleanest possible water. This will help from those tiles and tub getting stained from the hard water deposits. How Can I Remove These Stains? Those ugly stains look much worse than they really are. Simply fill a small bowl with some vinegar and start scrubbing the tub and tiles with a clean soft sponge. Make certain that the sponge that you are using does not have that abrasive pad on it. Using a pad like that will damage the surface of the tiles, making them more difficult to keep clean in the future. Gently scrub with a soft sponge or cloth, and you will easily remove all those stains from the surface of the tiles, grout, and even the fixtures in the bathroom too. Trying to get rid of those awful stains in your Bradford home? Call M.A.C. Stewart Plumbing at (705)7335154 today and see how we can help!